Khloe Kardashian jealous of Kylie Jenner's success? Reality TV beauty Khloe Kardashian feels jealous of the attention Kris Jenner is giving to her daughter Kylie, a source has suggested. 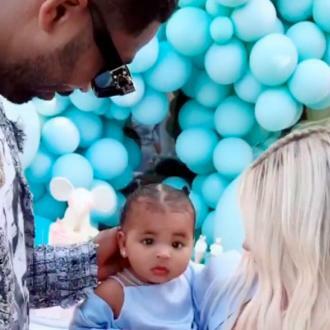 Khloe Kardashian reportedly feels jealous of the attention Kris Jenner is giving to her daughter Kylie. The 33-year-old beauty feels she's been neglected by the showbiz matriarch ever since Kylie's make-up business started to exceed their expectations, with Khloe recently joking that she and her siblings are ''dead to [Kris] now''. A source explained: ''Khloe was joking when she made that comment, but underneath it there's definitely some truth to her feelings. There has always been competition between the girls for their mom's attention. Kylie Cosmetics, the brunette beauty's business venture, is currently on course to become a $1 billion brand at some stage in the future. Khloe is ''proud'' of her half-sister's burgeoning business, but worries she'll receive less attention from Kris. The insider told HollywoodLife.com: ''She's super proud of Kylie, but she does worry that she's her mom's favourite now. It's hard to see her little sister build this empire so quickly, and get so much praise from her mom. Meanwhile, Kylie recently admitted she doesn't ''know what it's like to live a normal life''. The 20-year-old star explained: ''I don't know what it's like to live a normal life, where people just don't know who you are, to get out the car and not have everyone stare at you.